As He Hits The Road, Obama's Approval Rating Hits New Low : The Two-Way President Obama today sets off on a bus tour through Minnesota, Iowa and Illinois that will extend into the middle of the week. 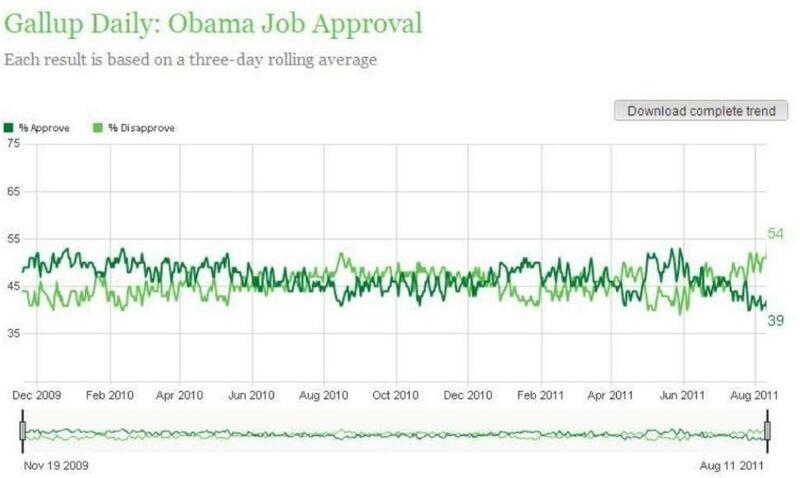 For the first time, his approval rating in Gallup's daily tracking poll is below 40 percent. President Obama today sets off on a bus tour through Minnesota, Iowa and Illinois that will extend into the middle of the week. For the first time since the president took office, his approval rating in Gallup's "daily tracking poll" has dipped below 40 percent. It touched 39 percent on Sunday, the polling firm says. The president's "disapproval rating" was 54 percent as of Sunday. Gallup updates its tracking poll every day around 1 p.m. ET. Update at 2 p.m. ET: Today's tracking poll puts the president's approval rating at 41 percent and his disapproval number at 52 percent. The poll is based on telephone interviews of about 1,500 adults across the nation. It's a "rolling" survey that covers the past three days (as each new day is added to the mix, one is dropped). The margin of error is +/- 3 percentage points on each result.